The Sustainable Manufacturing Toolkit, a new, free online resource developed with input from the International Trade Administration, can help U.S. businesses measure their environmental performance and thereby become more competitive. This start-up guide is part of the new Sustainable Manufacturing Toolkit, an online resource created with input from the International Trade Administration. Sustainable manufacturing—that is, the creation of products in an environmentally and socially responsible manner—has become a business buzzword lately. But as companies face increased costs for materials, energy, and regulatory compliance, sustainable manufacturing has also come to be recognized as a smart business practice, as more and more manufacturers realize that “greening” their processes can be a key strategy for achieving global competitiveness. It was in response to a dearth of internationally comparable performance indicators for sustainable manufacturing that the International Trade Administration (ITA) joined with the Organization for Economic Cooperation and Development (OECD), an international body headquartered in Paris, France, to develop the recently released Sustainable Manufacturing Toolkit. The toolkit consists of two parts: a 52-page start-up guide, which provides a step-by-step approach to measuring and benchmarking environmental performance, and a web portal, which supplements the guide with more technical guidance, data tools, and useful links. The heart of the start-up guide is a series of seven steps that companies can take to prepare, measure, and improve their sustainable manufacturing processes. The discussion of these steps is enhanced by seven “good practice” profiles that highlight successful efforts undertaken by manufacturers from around the world, including three located in the United States. 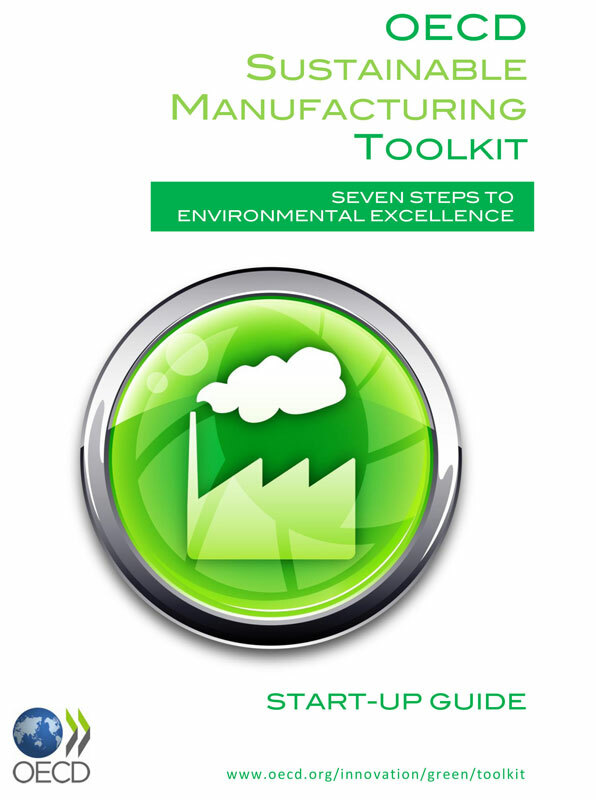 The Sustainable Manufacturing Toolkit is available online at www.oecd.org/innovation/green/toolkit. Resources available on the site include a downloadable booklet, Start-up Guide: Seven Steps to Environmental Excellence, as well as a variety of links to technical advice and examples of good practices. The global market for low-carbon products already exceeds $5 trillion, according to the OECD. Companies that can demonstrate green credentials will enhance their viability in the marketplace. But this can prove a particularly daunting challenge to small and medium-sized enterprises (SMEs). According to the OECD’s Wyckoff, while SMEs account for approximately 99 percent of all enterprises, and two-thirds of employment, in the 34 countries that are members of the OECD, many have not yet embraced the opportunities that come with the adaptation of sustainable manufacturing processes. “They may be struggling with their short-term survival, or cost pressure from clients, or lack of knowledge and resources to invest in environmental improvement, or simply not know where to start.” Thus, the toolkit was especially designed with the needs of small manufacturers in mind. The development of the toolkit was the result of a close collaboration between ITA and the OECD that began in 2006. The OECD was well situated to develop the toolkit due to its access to a wide array of public and private stakeholders and its unique collection of statistical data from around the world. This allowed for an unparalleled degree of comparability and applicability across borders. For its part, ITA was able to draw on the knowledge and experiences of a large number of U.S. experts through its leadership in the OECD’s Committee on Industry, Innovation and Entrepreneurship. By providing access to both business practitioners and academic specialists active in the field of sustainable manufacturing, ITA was able to facilitate the development and refinement of the toolkit, thus assuring that it was both user-friendly and met the real needs of industry.